Photographs of some of Bill Anderson's woodworking. Bill is a handtool woodworking artisan specializing in American Period Furniture. Using period tools and techniques, his work focuses on traditional design and joinery. Bill teaches handtool woodworking at his shop in Chapel Hill, NC, at Roy Underhill's Woodwrights School in Pittsboro, NC, and at the John C. Campbell Folk School in Brasstown, NC. For more information about this Chapel Hill, NC woodworker, visit his website. 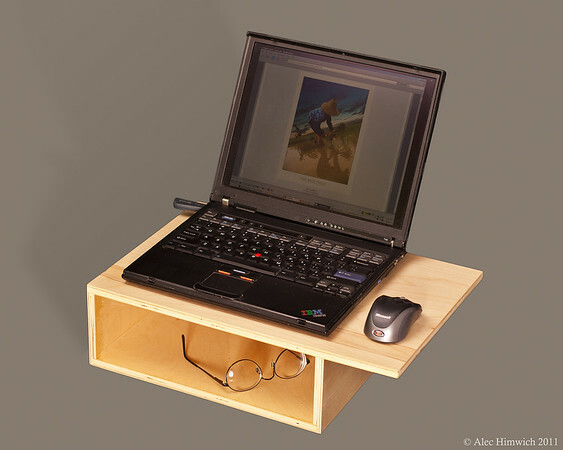 The design for this computer lap desk was inspired by a cardboard hiking shoe box that I used for more than a year as a lap desk for my computer. When the cardboard deteriorated to the point of collapse, I decided to make a computer lap desk of my own. Bill Anderson advised me as to what materials to use. After purchasing the .5 inch birch plywood for the project, I took it to his work shop where he proceeded in a couple hours time, to cut and glue the desk. Although the essential design of the desk is mine, it owes a great deal to Bill's refinements and suggestions. At this point, the desk is his invention as much as mine. In addition to its convenient size and dimensions, the key features of the desk are the storage area under the top surface and the overhanging edge for mousing. The overhang of the ledge is 4". The dimensions of the box are 5"x12"x14".